We do not curently have theatre tickets available for Hetty Feather. This could be because we have simply sold out or it could be that this show is no longer running. The information on this page remains purely for historical and informational purposes. Adapted from best-selling children's author Jacqueline Wilson's novel, the tale of plucky Hetty Feather is brought to life on stage by Emma Reeves, the award-winning scriptwriter of BBC TV's hit Wilson adaptation The Story of Tracy Beaker, and Olivier-nominated director Sally Cookson, whose critically acclaimed production of Jane Eyre seen at the Bristol Old Vic will be revived at The National Theatre this Autumn. 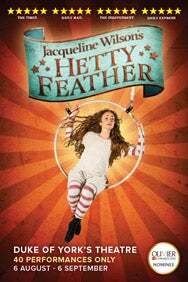 Featuring a musical score by Benji Bowe, thrilling aerial and circus skills and a huge heart Hetty Feather is the must see show for this summer. Following its sell out 2014 run in London's West End and a 2015 Olivier Award nomination for Best Family and Entertainmen, Hetty Feather returns to the West End for a smashing summer season for 40 performances. Hetty Feather was abandoned as a newborn baby and brought up by foster parents. But now she's six she has to return to the Foundling Hospital to start her education. You'll TREMBLE as she faces Matron Stinking Bottomly; THRILL as she discovers the squirrel house and Tanglefields Travelling Circus; GASP as she endures a night locked in the attic; QUAKE as she braves the scary streets of Victorian London and CHEER as she overcomes all in the search to find her real mother and a true family of her own.